1.25 Kg weight. Suitable for an 18 cm round or 15 cm square baking tin. Bake Time 2-2 1/2 Hours. 75 g Glace Cherries. Or add cranberries if preferred. 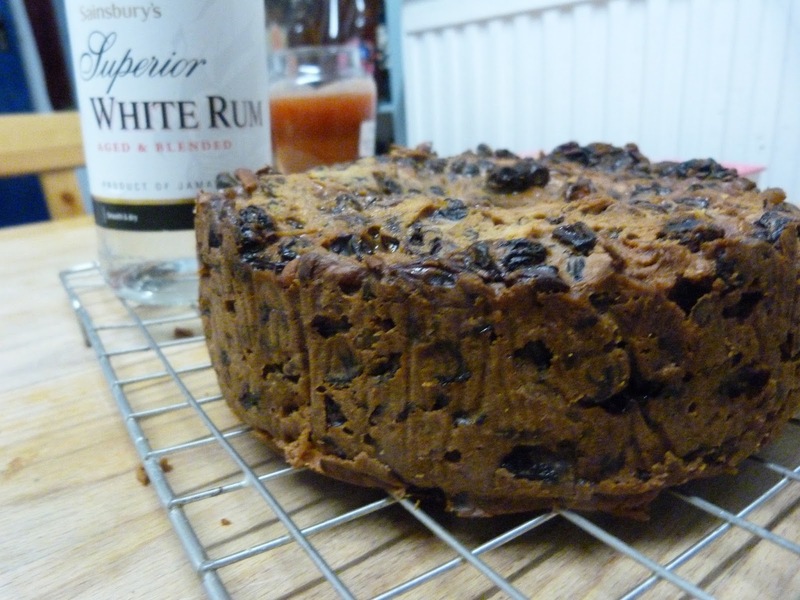 1 Tablespoon Rum, Brandy or orange liqueur, or Fresh Orange or Apple juice for non alcoholic cake. 1/2 Tablespoon Black Treacle or Golden Syrup. 2. Put the first seven ingredients into a large oven proof dish, mix well and cover with foil. Place in a cool oven 130 C Gas Mark 1/2 for 30 minutes.This allows the the fruit to become warm and sticky. Remove from oven, remove foil and set aside to cool. 3. Preheat oven to 145 C Gas Mark 1-2. Sift the flour,salt, mixed spice,nutmeg and ginger into a large mixing bowl add the brown sugar and combine well together. Add the softened butter and three quarters of the beaten egg and the black treacle or golden syrup. use a hand held or free standing electric mixer and beat for 1 1/2 minutes until the mixture is light and creamy. Add the remaining egg and beat another 30 seconds. 4. Add the dried fruit, walnuts and grated apple. 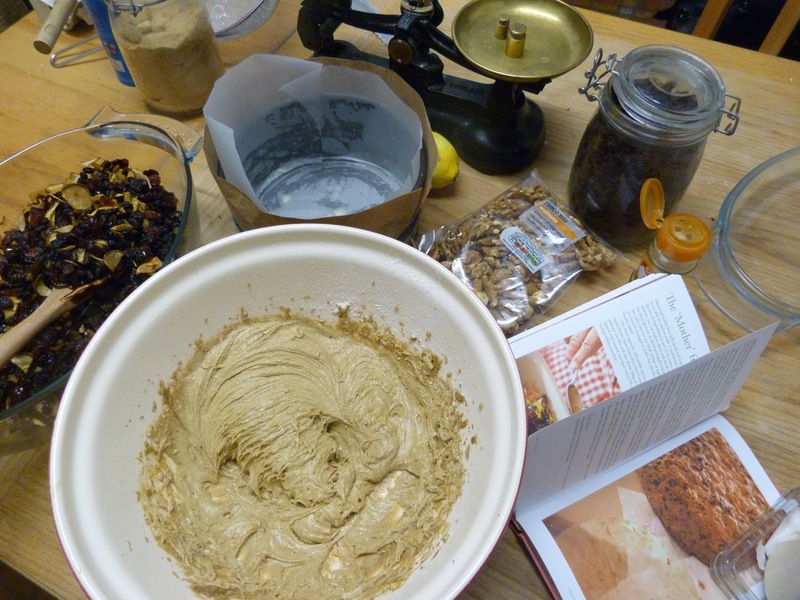 Using a large metal spoon fold everything together until thoroughly mixed. 5. Spoon the mixture into the prepared tin, smoothing it out lightly with the back of a spoon, making a slight hallow in the center of the cake. This will prevent it from from rising in the center.Place a piece of foil with a hole about 4 cm wide cut in the middle over the cake tin. 6. Bake in the oven for half the allotted time, remove the foil and continue to bake until the cake is golden in colour and a skewer inserted in the center comes out clean. trickle the remaining alcohol or juice over the top of the hot cake. 7. Allow to cool completely before turning out, leave the baking parchment on the cake until you are ready to slice it. This cake is good freshly baked or will mature nicely wrapped in grease proof paper in an airtight container and will keep for three months. I found this recipe in the River Cottage Handbook No 8. I hadn’t made my cake this year and so was pushed for time. I made this one at the weekend and used Rum, I added extra cranberries to boost my dried pear as I did not have enough for the recipe from the ones we dried earlier this year. It was a delightful recipe, looks wonderfully golden and moist. Am really not sure it will make it to Christmas as looks so yummy.